I finally realized I had to start taking care of myself which meant letting some things go that felt like they no longer served my soul and just didn't feel in alignment with my goals and vision. This was a hard process for me and I literally felt like I was re birthed during this time. I had to shed the things that no longer served me and had to shed some goals and dreams as well. Some of these goals I didn't want to let go and still wonder if it was the right thing to do now looking back. But, my intuition told me it was time to start fresh and find the things on my journey that I'm passionate about. Which led me back to blogging and writing. And also planted some other goals and dreams for my future. I had a rough couple months but I have been slowly getting back to blogging. 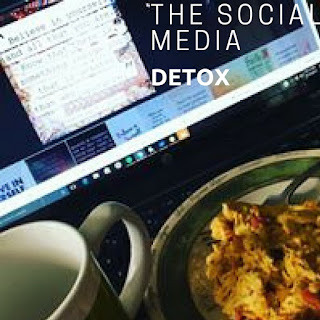 I felt like the social media detox was good for me. I wasn't obsessed with what to post or to post things I thought other people would like. Even with my blog. I blog for me and I felt awkward about switching my focus to the goddess, and spirituality, and cycle syncing. And talking about miracles. But, this is where I currently am at in my life and this is who I am. The real me. So when get back to social media it won't be for the likes. It won't be for the follows. Although I would be lying if I said I didn't like those things because obviously I do. I like when people like what I'm posting. But, when I post it will be for me. If I want to post my cats 3 times a day then heck why not. If I post my food (Which I will be when I start Cycle syncing) because I want to surround myself with a community that gets it. and hopefully through this blog I can share my different journeys. My health journey and my spiritual journey. I still consider myself a lifestyle blog because I will throw in some beauty as well and fitness. I am not a stick with one topic kind of girl. But, I like the direction my blog is taking. And I'm truly proud of the posts I've written lately. 3. Share my journey because maybe I can help someone else. Even if one person benefits then it's totally worth it. 4. Blog and post on social media for myself. Because it aligns with my soul and is something that makes me thrive. 6. Practice Sacred self-care on a daily basis and do what fills me soul up and is in alignment with my soul. Which some days may mean taking a break from the blog or social media. Nothing wrong with that. It's all apart of taking care of myself and listening to my body. If I'm burned out that won't help myself or anyone else. Have you ever taken a social media Detox? What did you learn from it? What are your blog and social media accounts filled with? Hopefully stuff you love. P.S Drop your link and I'll check out your social media.